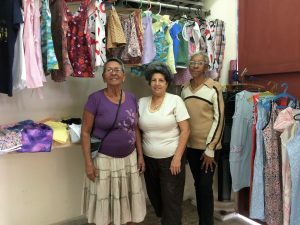 In 2016 we partnered with AllBrands of Baton Rouge to send sewing machines and supplies to Cuba. AllBrands sent new Brother sewing machines and we called on our wonderful supporters to donate supplies as well as money to purchase supplies. We ended up sending 5 huge boxes to Miami and from there, it traveled to Cuba. 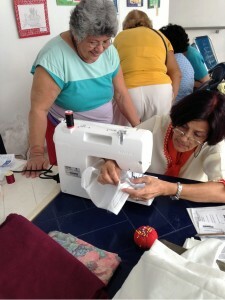 Sewing classes and sewing circles are growing and thriving through this effort. The sewers reached a milestone this month when they held their first sale of clothing they had made. Some of the proceeds from this sale will be divided among the sewers and the remaining funds will be reinvested to continue the development of their program. The sewers are enjoying this new creative outlet, the ability to earn some money, and most of all, to create a new community bound together by sewing. Congratulations, SMP! What a fabulous effort you’ve put forth for the benifit of so many! Thanks AllBrands and so many donors for getting behind this great opportunity to support sewers and sewing. Little things collectively CAN make a big difference.